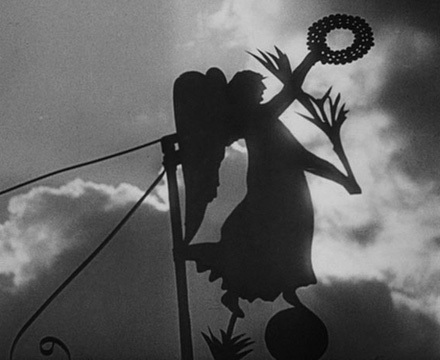 After his silent masterpiece The Passion of Joan of Arc failed as a commercial success, Carl Theodor Dreyer set out to make a “moneymaker.” Dreyer had seen how successful The Cabinet of Dr. Caligari and Nosferatu had been, so he thought that any attempt in the horror genre was bound to bring him mad cash by the fistful. And yet the resulting film, 1932’s Vampyr, is so far from anything anyone with half a brain would ever imagine as a popular success. It was a spectacular flop, worse than Joan of Arc, yet remains one of the oddest cinematic treatments of the vampire legend yet produced. Dreyer chose as his source material, Sheridan Le Fanu’s story “Camilla,” with its unusual female vampire and not-so-thinly-veiled lesbianism, not out of some sense of artistic choice, but because it was out of copyright and he didn’t want to deal with the Bram Stoker estate. Then, he completely ignored the original text and rewrote his own story, which he in turn abandoned once he actually started filming. So there’s not really much of a “plot” here; sure there’s a stalwart researcher who comes to a small provincial town in which strange things have been happening, and sure, some stuff happens, but not much of it adds up to anything. And, as if that weren’t enough, we’ve also transformed our floor into a giant ouija board. Because, really, we haven’t been taking advantage of the space’s paraspiritual potentiality enough lately. And we’ve got a few questions for grandma. 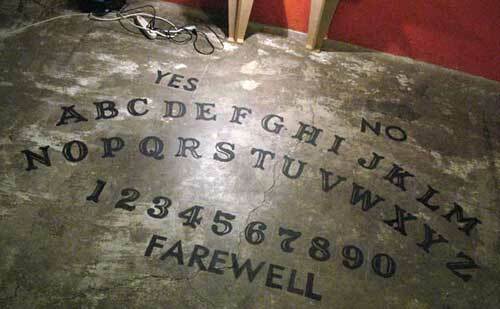 Giant Oujia Board is in fact an actual GIANT OUIJA BOARD! We are NOT KIDDING. This thing is Ouija and it is Huge. Betalevel, Parker Brothers and the estate of Carl Theodore Dreyer are IN NO WAY responsible for ANY confusion, discomfort or unspecified ill effects you may suffer from Giant Ouija Board including but not limited to: unseen spirits, giant spirits, uncomfortably large demonic possession, hitchhiking ghosts, disorientation, crazy eye, manifested destiny, “the willies”, the “giant willies,” or any mode of discombobulation due to accidental or intentional Portal Opening, Boundary Crossing or Encounter with the Abyss. Defense against demonic encounter is your responsibility! You are encouraged to memorize one or more incantations of Banishing and/or Consecration in the tradition of your choice. Please dress appropriately!!! Betalevel makes no warranty, express or implied, to the manifestation of spirits, ghosts, demons, pixies, sprites, hobgoblins, astral winds, etherial magnetism, or any other mode of Unseen Foce. All risks of nonperformance, reduced performance and/or banality shall be assumed by the User of Giant Ouija Board. For your own protection – please, no flash photography.